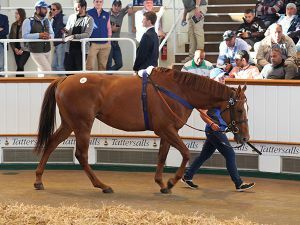 The Tattersalls July Sale made a buoyant start with six lots selling for 200,000 guineas or more and turnover of 7,029,500 guineas, the second highest turnover ever on the opening day of this sale. 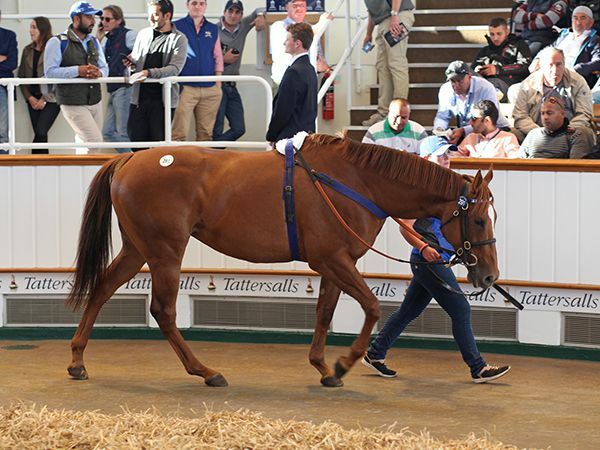 A total of 225 lots were sold for 7,029,500 guineas at an average of 31,242 guineas and a median of 10,000 guineas. The consignment from Godolphin was the highlight on the opening day with their 66 lots realising a total of 4,015,000 guineas and featuring four of the top five lots including the session topper TIME CHECK. The five-year-old daughter of SHAMARDAL has an outstanding Australian pedigree that goes back to Champion two-year-old TRISCAY, whilst TIME CHECK is also a sister to the dam of recent Godolphin star ASTERN. The mare was knocked down to Badgers Bloodstock’s Tom Pritchard-Gordon for 300,000 guineas after he saw off the efforts of agent Hubie de Burgh. Pritchard-Gordon indicated that she was for the same client as his earlier purchase, Lot 179 La Pelegrina, who he bought for 130,000 guineas. "As with the previous lot, we will sit down and discuss options and work things out," he said. "It is likely that she will end up in Australia - her pedigree has a lot of Australian influences and the family speaks for itself. "Shamardal is a good broodmare sire, she was a fairly good racehorse and she should be very easy to mate." 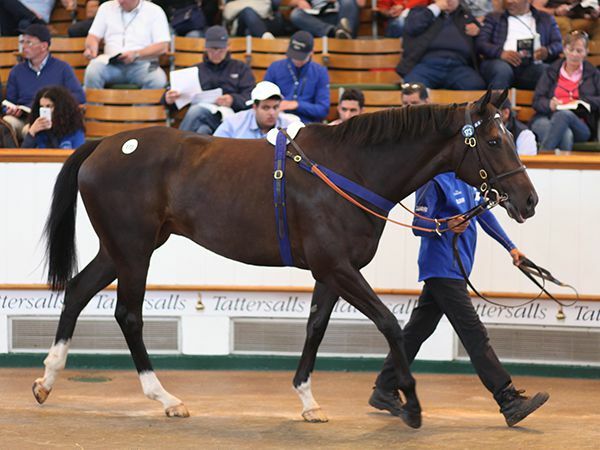 The Godolphin consignment also included the three-year-old sister to Grade 1 winner and promising young sire VIOLENCE, who narrowly missed the top spot when selling for 290,000 guineas to SackvilleDonald’s Ed Sackville after he saw off BBA Ireland’s Patrick Cooper. 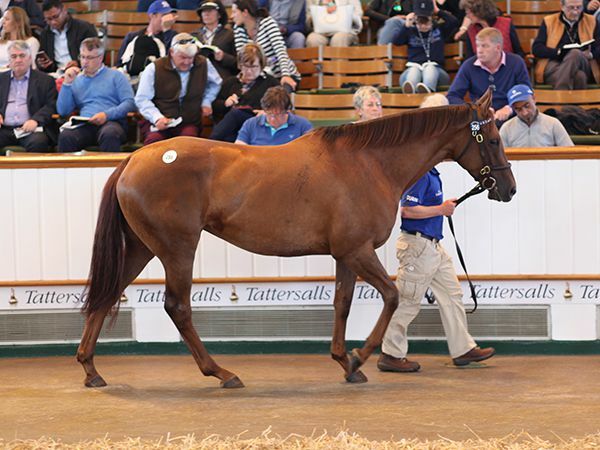 "She has been bought for a new client as a breeding prospect and will be going overseas," said Sackville. "She is a full-sister to a very good horse and a descendant of a very good US mare. She is an attractive and scopey filly." The unraced filly is by MEDAGLIA D’ORO out of the GONE WEST mare VIOLENT BEAUTY and hails from the family of Champion US mare and multiple Grade 1 winner SKY BEAUTY. Australian bloodstock agent Andrew Williams secured the equal third highest priced lot for the day when signing for WHAT SAY YOU for 270,000 guineas. The winning daughter of GALILEO out of the ANABAA mare ALTA ANNA was offered by Voute Sales with a cover to Ballylinch Stud’s exciting sire LOPE DE VEGA. "She will foal down in Europe and then we will decide what to do. She has a great international profile so everything is flexible, which is the coolest thing," said Williams. "Galileo is a fantastic broodmare sire, there is a lot of Anabaa blood here too, which I like, while I am also a huge fan of Lope De Vega." 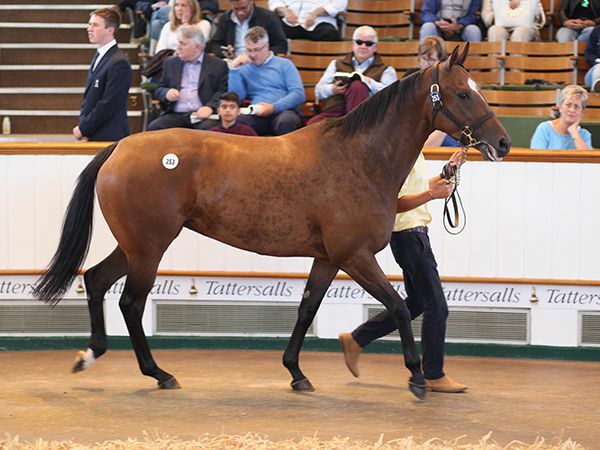 Three lots later that price was matched when Haras de Saint Pair’s Andreas Putsch bought the Godolphin owned DUBAWI mare LA PATRIA for 270,000 guineas. Sat alongside agent Crispin de Moubray, Putsch secured the Listed-placed daughter of the Group 3 winner EVIL EMPIRE, who was offered in foal to the Group 1 Dewhurst Stakes winner BELARDO. "She was a talented filly last year for Andre Fabre and as we all know his horses were sick then so she might be better than she got to show on the track," said de Moubray. "She is from a really nice family, which is German all the way through. We had to pay more than we hoped, but that's always the way!" The Tattersalls July Sale continues at 9.30am on Thursday, July 13.